Sindhu here. Today, I’m going to share a couple of fun cards with you. Both the cards involve the masking technique. One is also a shaker. Here is my first card.. This card involves masking and is also a shaker. First, I started by tracing a circle with a pencil lightly to act like a guide. Then, I stamped the images on Heffy Memo tape and fussy cut all of them out. Heffy Memo tape is a fantastic low tack tape and is great for masking. Then started stamping the images one after the other, on the circle, masking the previous image. I chose to not use the pumpkin and carrot images as they were large and were not helping me get a circle. Once I stamped everything, I erased the pencil lines and coloured the images with copics. 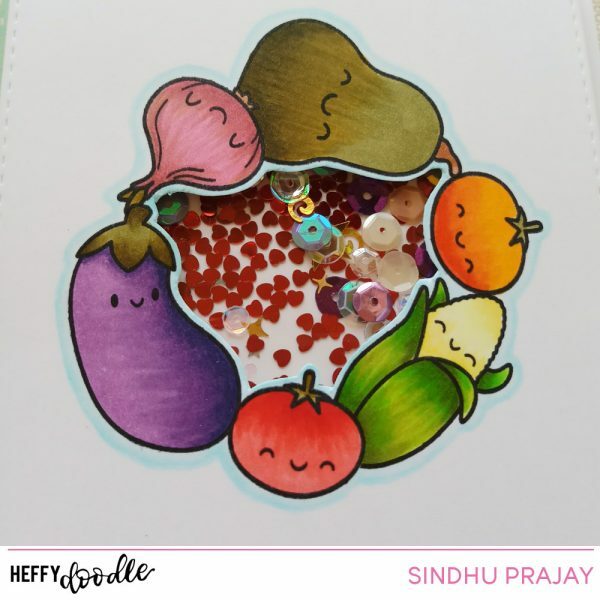 I fussy cut the inside of the circle as I wanted this card to be a shaker. I layered a patterned paper strip on the left of the card base, adhered the shaker panel on it and finished it with a sentiment from the same set. I stamped the sentiment on the same patterned paper used on the card base. The image is just too cute to add only one on the card. So, I added a bunch of them with some masking. It is easier than it looks. Again, I used the mask I already cut for the first card. But I needed two masks. So, cut another one from Heffy Memo tape. 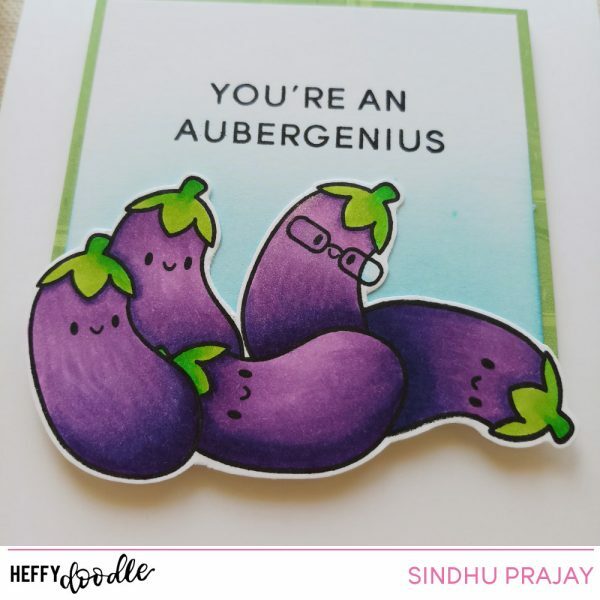 I fussy cut the bunch of eggplant images. I sponged blue ink on a piece of white cardstock, layered it on a piece of patterned paper abd adhered the image on it, partially hanging off the edge. 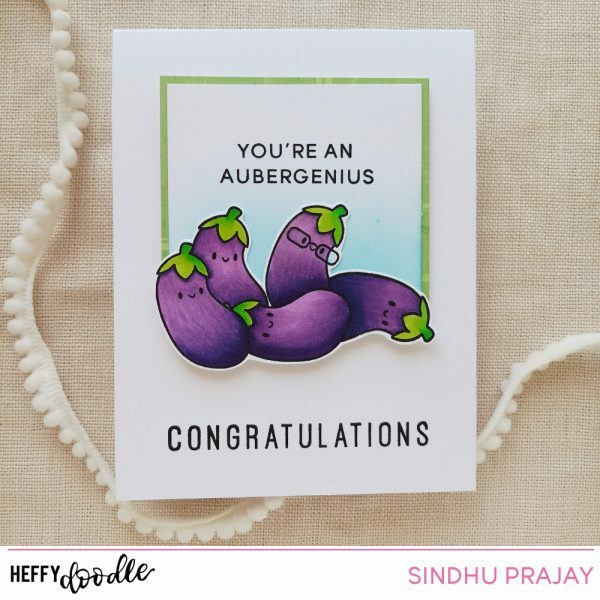 I stamped the sentiment from Veggie Patch stamp set. Adhered the layered panel on card base and stamped the ‘congratulations ‘ from Everyday Sentiment Duos stamp set. I masked the subsentiment and only stamped the ‘Congratulations’ part.